← Another year, another cocktail menu… 5th Edition of the “Scientist McGee Cocktail Menu”! I’m back with an updated Cocktail Menu sooner that I’d expected. Previously, I’ve updated this “book of recipes” on an annual basis. But with the addition of the ingredient index in the most recent 2014 update, I’ve decided that it’ll be more practical for me to update this collection of drinks more regularly, a few drinks at a time, as opposed to a whole year’s worth at once. 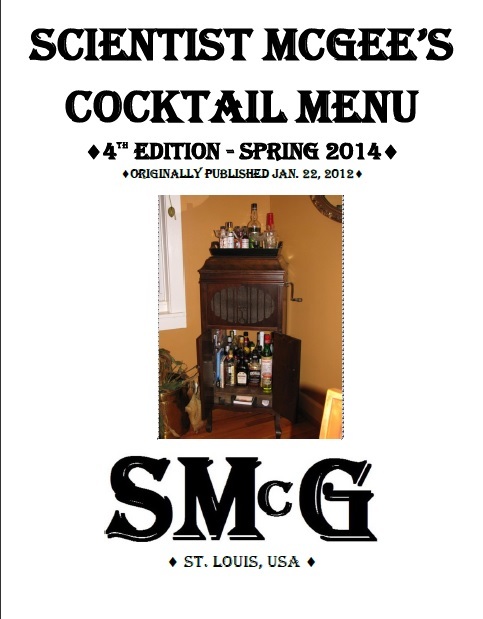 That being said, here is the 4th incarnation of my home cocktail menu for you to enjoy. Since the last update in January of this year, I’ve added 14 new drinks to consider, 2 of which are originals of mine and another an original from http://stayathomecocktails.blogspot.com/2014/04/stay-home-original-dont-blink-cocktail.html . So please enjoy this latest incarnation, and by all means, if you have any drinks you think my collection is missing and that you think I’d enjoy, please send me a note.